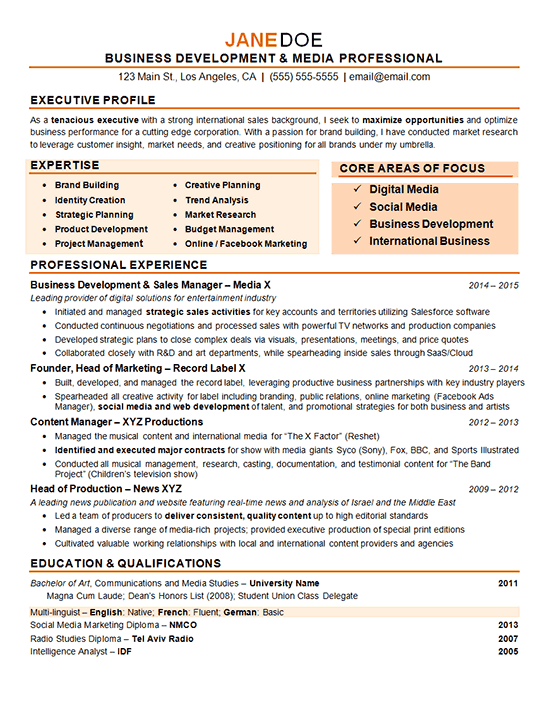 This job seeker was very successful in the field of digital marketing and hoped to leverage the attention of stakeholders with this resume. It was the goal to have a powerful resume in their portfolio, which described the growth in their career, as well as the highly reactive activities they have initiated. 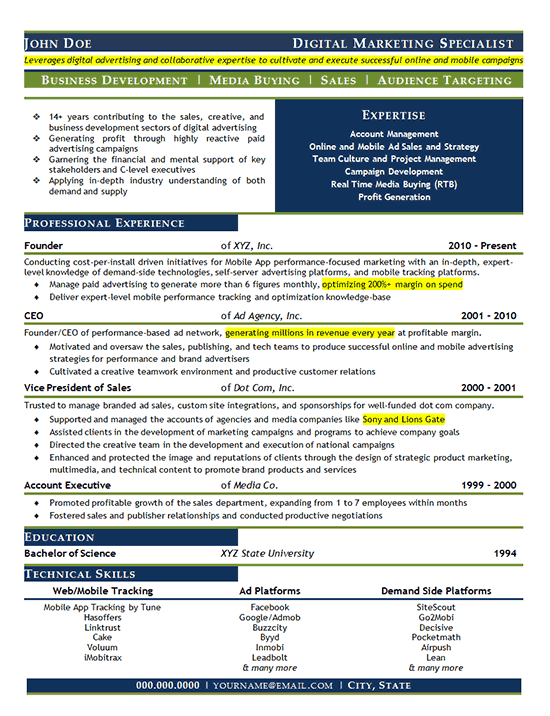 The main challenge with this resume was highlighting just the most important and relevant information necessary to include on this one-page document. In addition, it was necessary to list all of the technical and transferrable skills that made this candidate so successful in the first place. With these goals in mind, the Expertise section came to life to highlight valuable skills possessed by the candidate, and to the left of the Expertise section was an Achievement Analysis, which gave a brief profile of the candidate’s professional objectives. It was imperative to keep the bulleted points beneath each position to a minimum; therefore, we incorporated achievement-oriented points and quantitative tasks. Because this candidate was very well-rounded, it was a challenge to include and somewhat highlight their many specialties and achievements, but we managed to create a powerful document that can be used within and outside of the candidate’s current role. Forge relationships with potential clients in order to integrate partner products. Lead the execution of brand digital campaigns, strategies and advertising programs. Create and implement paid search display and remarketing campaigns for customers. Work with marketing team to plan and deploy digital media projects. Hire and manage digital marketing and online support teams. Optimize campaigns to improve conversions, cost per impressions and cost per click. Coordinate with creative team on the development of text and images ads. Provide strategy and budget recommendations for digital channels based on campaign objectives. Maintain compliance with online industry advertising guidelines and best practices. Ensure that digital campaigns meet budgets and ROI goals. Monitor project and campaign budgets while reporting providing progress reports to executive board.